The garage is located between LaSalle Ave and Medau Place. Behind the garage, there is a short walkway that has access to the trail on both ends. The LaSalle Ave side consists of 4 stairs and a graded ramp up to the trail. The Medau Pl. side (behind McCaulou's, parking lot and has a gentler ramp. 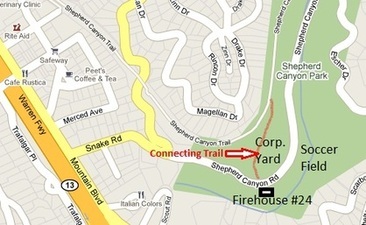 The trail ends in the residential area of Shepherd Canyon at Saroni Drive. Montclair Village is accessible by car, bus and bike. 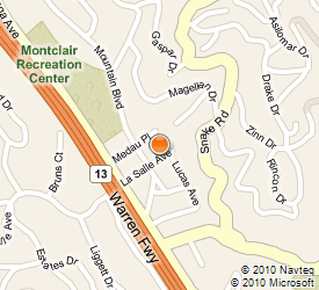 Montclair Parking Garage (6325 LaSalle, Oakland 94611) - Free parking on Sundays. Corporation Yard, across from Fire Station 24 on Shepherd Canyon Road. Shepherd Canyon - Street parking on Paso Robles Dr at Bishops Court. Shepherd Canyon Park The Montclair Railroad Trail connects to Escher Dr, just before Bishop Court. From Escher, hikers can hike up to the Torri Gate in Shepherd Canyon Park to view Bay vistas. From the Torri Gate, Hikers can hike down to the meadows and soccer field and reconnect back to the Railroad Trail through the City Corporation Yard across Oakland Firehouse #24. EBRPD Redwood Regional Park, Huckleberry and Sibley The Montclair Railroad Trail connects to Redwood Park through the residential streets in the Montclair Hills. Just before Tiffany Lane after Paso Robles Dr, make a right on Banning Dr. Hike on Banning to Moore Dr, make a left on Moore to Aitken Dr. At Aitken, make a left to Evergreen and hike up to Skyline Blvd. At Skyline, turn right to reach Redwood Park and turn left to reach Huckleberry and Sibley Park. Corporation Yard, across from Shepherd Canyon Rd. firehouse.